Milkweeds have very distinctive flowers, with unique shapes and features. I guess it shouldn’t be surprising that their pollination story is equally interesting. Common milkweed (Asclepias syriaca) flowers. Lincoln Creek Prairie – Aurora, Nebraska. First, milkweed flowers don’t produce thousands of of individual pollen grains that can each get carried away to other flowers by visiting insects. Instead, milkweeds have what are called “pollinia”, or waxy masses of pollen that are designed to stick to insects. You might think that a flower with a specialized pollen structure like that would have a system to make it easy, or even automatic, for any visiting pollinator to pick up and deliver that pollinia to the next flower. After all, there are countless stories of flower types that facilitate pollination by forcing visiting insects to hit the right spots as they forage for nectar and pollen. With milkweeds, not so much. In order for an insect to pick up one of the pollinia from a milkweed flower, its leg has to slip into a tiny slit between the anthers along the side of the flower. As the insect struggles to pull its leg back out of that tiny opening, it might emerge with a pollinia stuck to it (or it might not). However, in order to complete the pollination cycle, that SAME insect has to then visit ANOTHER milkweed flower and have the SAME leg slip into the anther opening in THAT flower! AND even if that happens, the pollinia still needs to come in contact with exactly the right spot inside the flower. 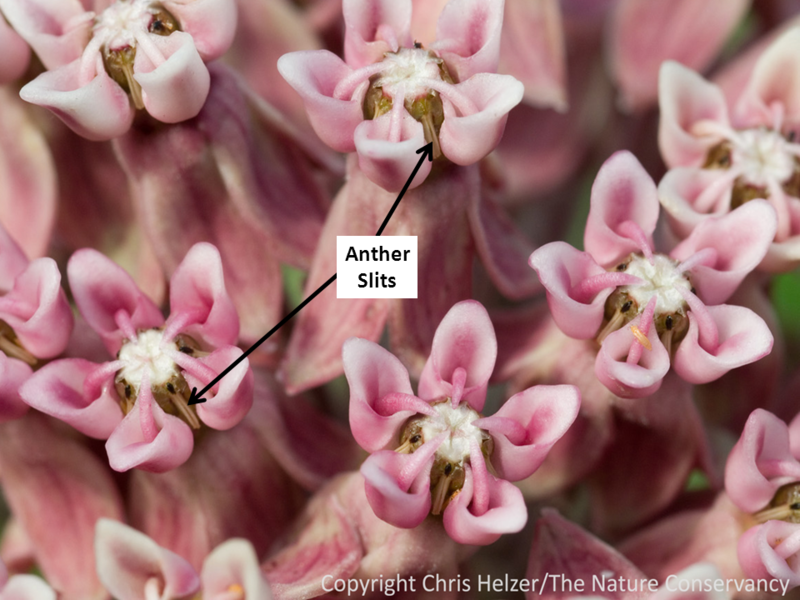 Here is a slightly zoomed in look at the milkweed flowers, with arrows indicating the tiny slits between anthers, into which an insect’s leg must slip in order to pick up the waxy bundle of pollen. Regardless, it seems to work often enough – there are lots of milkweed seeds around every fall! 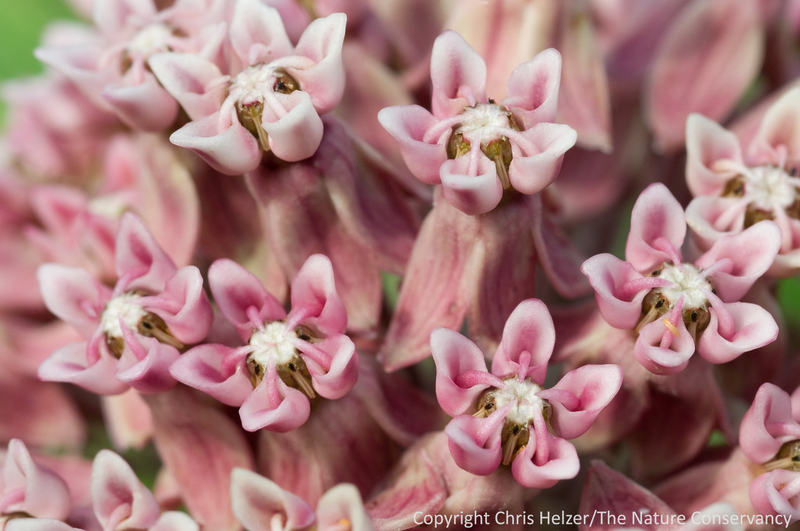 If you’re interested in learning more about milkweeds, pollination, and other information, a great description – with lots of really nice photos – can be found in this excellent article by Brian Johnston in the online Micscape magazine. If you want to delve into the scientific literature on this subject, you might start with this article in the journal Ecology. This entry was posted in General, Prairie Insects, Prairie Natural History, Prairie Photography, Prairie Plants and tagged anthers, asclepias syriaca, common milkweed, grassland, how milkweed is pollinated, leg, milkweed, nature, photography, pollination, pollinators, pollinia, prairie, slit by Chris Helzer. Bookmark the permalink. Nice post, interesting. I wonder if this is related to the intense smell of the flowers. Maybe they overpower the senses of the insects so they cannot use “reason” and will do anything to get to the nectar, including risking self-harm. I also wonder if the weight of the pollinia leads to self-pollination due to its very heaviness, i.e. the pollinator is likely to stick around locally and also work to remove the item from itself by perhaps scraping its legs on the flowers… All very smart adaptations. Suzanne – great questions… I don’t know the answers! My guess is that the nectar is a bigger factor than the scent, but that’s nothing more than a guess. Very interesting! I’ve been enjoying the various milkweeds that are blooming here at Wind Cave this past week…..and trying to capture (in picture) the different “polinators” – I had no idea milkweed pollination was so complicated. I’ll be keeping a closer eye out now. Thanks for posting! Good lawd, talk about a hassle. It’s a wonder there are so many milkweed plants around. I’ll be clicking over to the links you so generously provided. Thanks for another fascinating post. Chris, Although the snare type mechanism used to attach a pollinia to an insect is quite elaborate, I was always informed that pollination from that point forward was not so very unusual. I was told pollination was completed when the pollinia made contact with the white part in the center of the flower (i.e. the stigma portion of the gynostemium). hmm … some things I just have to try myself. I just put netting over 6 unopened Asclepias tuberosa panicles. When they open I will try it both ways and see if any pods develop. I became curious about milkweed pollination because we have a very rare milkweed locally. The small population has only produced a pod once in 20+ years. Something removed the pod so seed never was formed. The CBG is currently doing a project on it. However, I have not been able to obtain any information on their research results. My thought was that they should just keep trying to cross pollinate it. However, I have been told the reproductive issue is more complicated. That is all I know. I wish I could get more information about the work that is occurring with this rare species. I have a thought…perhaps the original pollinaters of this most challenging plant has gone extinct???? Or almost extinct????? So now the other pollinaters have been evolving to take their place????? Perhaps the milk weed could be pollinated by many critters as long as they were up to the challenges, but at one time they had that one specilaized critter that pollininated them that is now rare????? Or Gone????? I know that milk weed is very common plant and that speaks to evolution addressing the changing challenging problems of survival. Why did this plant create the kinds of specilized anatomy that it did???? Was it to control the amount of energy needed to produce the appropreate amount of seed the plant could concevably make viable? Just a thought!!! Just a question!!! One of many!! It’s a good thought, Karen, but as far as I know, milkweed gets pollinated by a lot of different kinds of insects – it certainly doesn’t have a flower structure that restricts the kinds of insects that can get nectar from it. In addition, there aren’t actually very many prairie insects that have gone extinct (maybe none?). I think it’s just an interesting strategy that has developed over time, and that apparently is pretty successful – though odd – because the species seems to be doing just fine! The Rocky Mountain Locust comes to mind. Although it is likely no one misses them. I am sure there are others. Some milkweeds are actually quite rare. The species I was writing about before is Ascelpias languinosa. My state (Illinois) lists 4 species of milkweeds as endangered with one of those also being on the federal list. Although the common milkweed is thriving with human created disturbance, a number of other milkweed species are in trouble. Studying pollinators and if they have now gone extinct in small “island” preserves is a research topic of interest. I have included a link to a paper on pollinators observed for different milkweed species.